Ignacio Aguda-Padrón has recently published a suite of short communications on different conservation aspects of land snails in Brazil. In a first paper (Agudo-Padrón, 2012a) he reviews briefly the effects of the introduction of the Giant African Snail on the native snail population. Abstract: A diagnostic about the conservation status of the Brazilian native land snails, severely threatened by human actions and attempts for the eradication of the invasive exotic mollusc species Achatina (Lissachatina) fulica (Bowdich, 1822) is presented. Purposely introduced in the country in 1988 for human food purposes (continental malacoculture), this species ended up being officially banned later in 2003, triggering hasty public actions, directly involving the “unprepared” Brazilian population through the means of social communication, aimed at their control and eradication of the environment. Consequence of this procedure, premature and alarmist, today many species of native and endemic terrestrial snails, poorly known scientifically, are under increased threat of extinction in Brazil and, very probably, in other South American countries. The same data have been re-published in Agudo-Padrón (2012b). 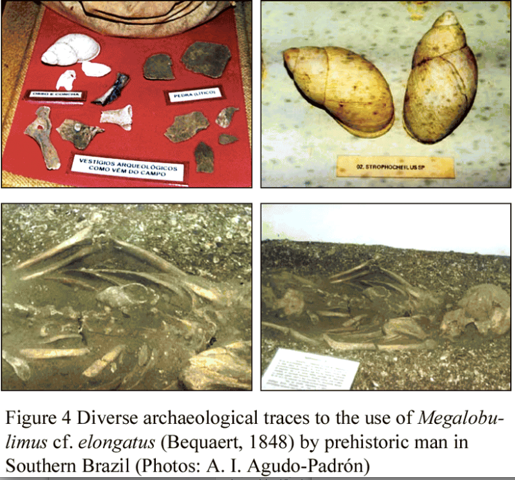 In a second review (Agudo-Padrón, 2012c) he summarizes the available data on biogeography concerning snails in the southeastern part of Brazil and adjacent areas. Abstract: A preliminary diagnostic test summary balance sheet and rough on the marine and continental mollusc fauna, terrestrial and limnic/freshwater, occurring in the geopolitical region of the Southern Brazil and adjacent is presented. Result of extensive research work in the field and analysis of regional natural history reference generated off dilated bibliographic production, developed in the course of the last 13 years (1996~2009), aims to characterize and integral organization of their unique knowledge, emphasizing the major ecological and geographical factors that determine their presence, spatial location and occupancy of available environments. Parallels, the comparative results regarding the total numbers of species estimated for each of the portions of the territory geo-spatial components analyzed, the Brazilian states of Paraná (PR, 332), Santa Catarina (SC, 772), Rio Grande do Sul (RS, 492), and the neighboring countries of its southern Uruguay (373) and Argentina (535), members as a whole so-called Atlantic Slope region of the Southern Cone of South America, to the West of the Andes. Finally, a recent publication summarizes the conservation status of terrestrial snails, both as recognized by the IUCN and by local Brazilian authorities (Agudo-Padrón, 2013). Seemingly in consensus, if one accept that the same criteria have been used, it is remarkable that IUCN recognized a more severe category in six cases. In two cases no joint data are available and in two other cases their judgement of the situation is identical. Only in the case of Gonyostomus insularis the Brazilian verdict ranks this species in a higher category. One can only guess what is the different reasoning behind all this. This entry was posted in Uncategorized and tagged biogeography, brazil, conservation on March 26, 2013 by bramb. Thanks for the blog comments Bram. 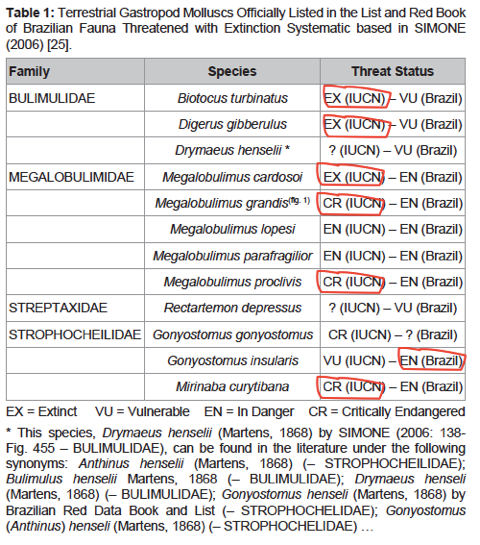 The IUCN assessments for these species was undertaken in 1995, by Maria Cristina Mansur, a member of MSG. The IUCN Categories and Criteria and standards of documentation were very different then, and it is quite typical for new information to become available showing species are more or less threatened than a previous assessment. However the Red List is rather like an editted journal, in that someone has to send in a reassessment of the species meeting the minimum documentatioin requirements, for the peer review process to start for the species and the update to happen.